International Day of Support of Torture Survivors Thursday June 26th-Demand Reparations! June 26th marks the International Day in Support of Survivors of Torture. Join Amnesty International, Chicago Torture Justice Memorials, and Chicago Coalition to Shutdown Guantanamo to demand justice for Chicago torture survivors and torture survivors around the world. Join Us This Friday June 20th 5PM At Water Tower to Demand No More War On Iraq! It’s time to be in the streets in protest, demanding NO further war on Iraq. President Obama will appear Tuesday evening in Manhattan, where he will see us. Other protests, including tonight at The White House at 5:00 pm, will happen across the country this week. We urge you to join in. The U.S. has been overtly trying to control Iraq since 1990 and is responsible for uncounted deaths from bombs, sanctions, occupation, and destruction of the environment by the use of depleted uranium and other toxic weapons. “Kinetic strikes” have always killed mainly civilians. The current problem is NOT that the U.S. finally withdrew military forces in 2012, but its illegitimate invasions in 1990 and 2003, and its 20+ year aggressive war of sanctions and occupation against a country which never attacked the U.S.
“The US invasions under both Bushes and the continued occupations under Democrats, both Bill Clinton and Obama, have spawned the sectarian fighting and truly massive suffering in Iraq. Now Obama is trying to drum up support for escalating the U.S.’s war on the Iraqi people in response to the violence that the U.S.’s invasion and occupation have themselves caused.” See more in “Iraq: A Point of Orientation” by Dennis Loo, editor of Impeach the President: The Case Against Bush & Cheney. No party in this fight, not the “insurgents,” not the Maliki government — paid for by the U.S. — and certainly not the U.S. itself, has “right” on its side. In reference to ISIS (Islamic State of Iraq and Syria, also known as ISIL—the Islamic State of Iraq and the Levant), one of the insurgent groups fighting the Iraqi government (which has been supported by the U.S. for years), Revolution newspaper reported, “This is a reactionary force. In the sizable areas they control, they ban music, force women to wear the niqab—a covering with only a small opening to see through—and terrorize other Muslim sects and non-believers. There are reports coming out of Iraq that ISIS massacred Iraqi soldiers taken prisoner.” Read more. We in the U.S. need to make a statement to the world that we oppose any U.S. intervention or military attacks in Iraq. By exposing and standing against the lies and crimes of the U.S. government in Iraq, led first by Bush and now by Obama, we can make a difference in how people see what’s going on. See Raed Jarrar today on Democracy Now, who says that, whatever you name it, from the Iraqi perspective, U.S. military strikes on Iraq will not bring a solution. He says that almost everyone fighting in the country is an Iraqi, and “The U.S. has historically been part of the problem” and U.S. intervention will only bring more violence. Protest against possible US bombing of Iraq when President Obama appears at Democratic Party fund-raiser. Gotham Hall 1356 Broadway between 36th/37th. Join OR Books and Chelsea Manning’s supporters to mark one year since she went on trial for leaking the Iraq and Afghanistan war logs to WikiLeaks. Journalists, activists and artists who attended the trial will read from a new graphic book, “The United States vs Private Chelsea Manning : A Graphic Account From Inside the Courtroom” Facebook event. More protests against ongoing US War on Iraq, Thursday, June 19-Saturday, June 21. County Courthouse, 5th & I St.
Topic for discussion: Iraq, Syria — What is going on? What are the “interests of the United States” as defined by Obama, and what are our interests in this situation? 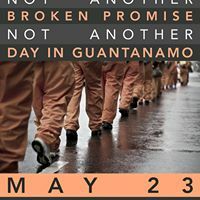 Join Us This Friday May 23rd for Global Day of Action to Demand Close the USA’s Torture Camp at Guantanamo Now! On May 23rd of last year, President Obama again promised to close the detention facility at Guantánamo. His pledge came in response to the mass hunger strike by men protesting their indefinite detention and to the renewed, global condemnation of the prison. One year later, far too little has changed: few detained men have left the prison, and hunger strikes and forced feeding continue. JOIN US in Chicago to urge President Obama and Congress to end indefinite detention and close the detention facility at Guantánamo. There will be simultaneous actions across the country, too. We will gather at 4:30pm at the Water Tower Park (Chicago and N. Michigan Ave.). There will be a performance piece highlighting the poems of the men detained at Guantanamo and speech Pres. Obama made this time last year. Then we will march to Tribune Plaza and perform a skit and mic check to give voice to the men at Guantanamo. Lastly we will march to Millenium Park and end our march there with a mic check. If you are on Facebook, please join our event there and invite friends! Drones,Dirty Wars, & Guantanamo:Join Us May 9th and 23rd to Say No More! 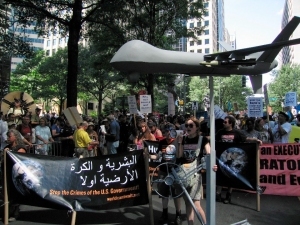 Around the country, people are speaking out against – and acting to stop – drone wars and surveillance. Over 80 actions have been announced, from Hawaii to Maine, during the Spring Days of Action 2014. Here in Chicago, we will add our voices next Friday, May 9. We will have a model drone (as pictured here) and we will have photos and read the names of some of the thousands of innocent civilians killed in the US war OF terror in Pakistan, Yemen, Afghanistan, and Somali. Moazzam Begg, a British citizen held for years without charge or trial at Guantanamo and since released, has noted that Obama seems to prefer assassination over indefinite detention, moving to directly terrorize whole areas of countries with which the US is not officially at war. World Can’t Wait, Voices for Creative Non-Violence, and the Chicago Coalition to Shut Down Guantanamo are joining together to take this message to the public. Drones, indefinite detention, and the dirty wars they are integral to are immoral and illegitimate! We also have copies of two films about drones that we would be happy to share with you. Get in touch if you are interested. We will gather at 4:30pm at the Water Tower Park (Chicago and N. Michigan Ave.). There will be a performance piece highlighting the poems of the men detained at Guantanamo and the speech Pres. Obama made on this date last year. Then we will march to Tribune Plaza and perform a skit and mic check to give voice to the men at Guantanamo. Lastly we will march to Millenium Park and end our march there with a mic check. April 22, Earth Day: Act to Stop Environmental Devastation. As Earth Day approaches, life on this planet faces a true emergency. The latest report by the UN Intergovernmental Panel on Climate Change (IPCC) concluded that the world is running out of time to reduce carbon emissions and prevent already noticeable harms from “spiralling out of control.” And yet fossil fuel consumption grows, tar sands extraction expands, governments spout words of concern, and nothing at all commensurate with the crisis is done. “Politics as usual will not reverse” this deadly direction. 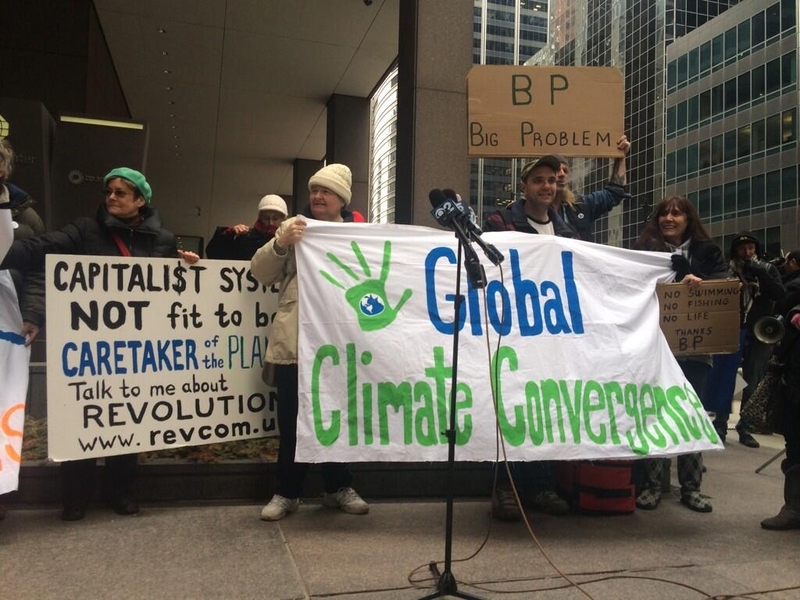 World Can’t Wait Chicago has endorsed the Global Climate Convergence Rally and March on Earth Day and urges our friends and supporters to take part. The rally begins at 4:30 PM, Tuesday, April 22, at the State of Illinois Building (100 W. Randolph, Chicago), and the march following will “protest some of the biggest climate criminals,” including the Boeing Company, Chase Bank, and British Petroleum, which just dumped toxic tar sands into Lake Michigan last month. The Facebook event is here, for those of you on FB. This climate crisis inspired World Can’t Wait Chicago to initiate the Climate Crisis Conference here in February 2013. The situation is even more urgent a year later, and the presentations from that conference are well worth revisiting. Revolution Books Chicago (1103 N. Ashland) is screening two of them this coming Sunday, April 20, at 4 pm, followed by discussion of the environmental emergency. They will show the presentations by Carl Wassilie, Yup’ik Alaskan biologist and co-founder of Alaska’s Big Village Network, on “Ground Zero for Climate Change: America’s First Climate Refugees,” and by Orpheus Reed, writer for Revolution newspaper, on “State of Emergency: The Plunder of Our Planet, The Environmental Catastrophe, and The Real Revolutionary Solution.” You are invited to join the discussion and debate about how we can stop this catastrophe! Director Robert Greenwald investigates the impact of US drone strikes in Pakistan and elsewhere. The film highlights the stories of 16 year old Tariq Aziz killed by a drone strike and school teacher Rafiq ur Rehamn, whose mother was killed and children hospitalized due to a drone strike in 2012. This event is sponsored by Occupy Evanston, Democracy in Action Chicago, Coalition for Political Reform, and World Can’t Wait Chicago. Teachers, friends: We have copies of two short films on drones that are particularly well-suited to classroom use, “Wounds of Wazistan” and “Unmanned,” the story of a young drone pilot’s struggles with his job. Both are only about 20 minutes in length, leaving time for discussion. Contact us to arrange a showing for your students, youth group, congregation or family and friends. More information on the national Spring Days of Action to End U.S. Drone Killing & Surveillance and organizing materials are available here. Drones: Terror for Humanity and the Planet. Don’t Miss These Events Tonight 4/2 !!! If you said the US military is the largest user of fossil fuels, you’d be right. Obama is in Chicago today (Wednesday), April 2, for a fund raising event in Lakeview, and environmental activists are calling for a demonstration to demand that he reject the Keystone XL pipeline and stop expansion of all tar sands pipelines, demands we in World Can’t Wait support. Join us! What: Demonstration at Obama fund raiser When: 5:30 PM, Wednesday, April 2 Where: Corner of W. Fullerton and N. Janssen, Lakeview, Chicago For those on Facebook, you can join the event there and invite friends. The push to extract and burn fossil fuels, including toxic and ultra-destructive tar sands, is driven by more than the need for fuel for this system’s constantly expanding production, and profits. Fossil fuels are also a strategic resource the US seeks to control and use to its political and military advantage. The US military itself, with bases around the globe, uses more fossil fuel than the entire US domestic economy, which is bigger than any other economy because it’s the heart of the US empire. From “dirty wars” and drone strikes to the decimation of First People’s homelands in Canada and the water and farmlands of Nigeria’s delta, this is all leading to an unliveable world. Approving the Keystone XL Pipeline in the face of yet more dire warnings about climate crisis would be another crime of this government. Join us to say NO! 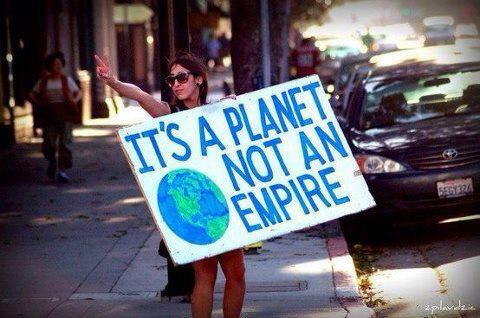 Humanity and the Planet Come First! Stop the Crimes of Your Government! * * * * * * * * If you can’t make it to our protest, don’t miss the live webcast (link below) of this event – you can watch it wherever you have Internet access! Wednesday 7:00 pm – 8:30 pm (6 pm – 7:30 pm CDT) Community Church 40 E. 35th Street, NYC A live program & international webcast in support of the Spring Days of Action – 2014, a coordinated campaign in April and May to End Drone Killing, Drone Surveillance and Global Militarization. Madiha Tahir, film maker, Wounds of Waziristan An independent journalist reporting on conflict, culture and politics in Pakistan, she has followed the U.S. drone attacks there for years. Maria LaHood, Senior Staff Attorney, Center for Constitutional Rights who specializes in international human rights litigation, seeking to hold government officials and corporations accountable for torture, extrajudicial killings, and war crimes abroad. Carl Dix, Vietnam War resister & Revolutionary Communist Party. A leader of protests against police brutality, stop-and-frisk, & founder, with Cornel West, of the Stop Mass Incarceration Network. With information from the Granny Peace Brigade, kNOwdrones and World Can’t Wait on what you can do to in your schools & communities to create a political situation where the U.S. is forced to back off from using targeted killing in our name. 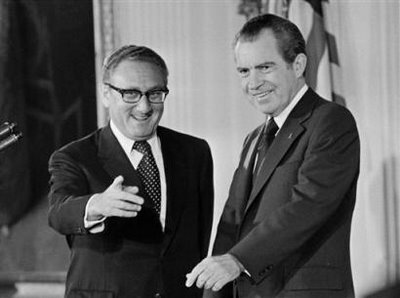 Is Henry Kissinger – a mastermind of the US war on Vietnam, Laos and Cambodia during its bloodiest years – a humanitarian? ++ Besides being a leading architect of the U.S. war on Southeast Asia which killed over 3 million people, Kissinger was a key promoter of the 1973 coup that overthrew Chile’s government, killing its democratically elected president and thousands more, and imprisoning and torturing more than 10, 000 Chileans. ++ Kissinger organized U.S. support for the 1965 coup in Indonesia, where the CIA assisted by “naming names” of communist activists, promoting the deaths of half a million people. ++ In 1975, he and President Ford gave the green light for the Indonesian dictatorship to invade newly-independent East Timor, which led to the deaths of over 200,000 people, according to Amnesty International — one-third of the country’s population. ++ Kissinger is known to have supported the assassinations of heads of government in Congo, Cuba, Cyprus, and South Vietnam. ++ He promoted the notorious “Operation Condor,” a program of torturing and murdering 10s of thousands in Argentina, Bolivia, Brazil, Chile, Paraguay and Uruguay. The United States’ failure under both Democratic and Republican administrations to criminally prosecute Kissinger, a man responsible for the deaths of millions, means that the U.S. has no moral authority to criticize human rights abuses anywhere in the world. “Never again” to the Nazi Holocaust of the 1930s and 1940s should mean “Never Again” to any program of mass murder and torture. Because we abhor the mass murders of Jews and millions of others by the Nazis, we oppose this honor for Henry Kissinger. Please call the Illinois Holocaust Museum at 847-967-4800 and protest their choice of Henry Kissinger, America’s #1 living war criminal, as their keynote speaker. If you are on Facebook, please join our event there and invite friends. Co-sponsored by the 8th Day Center for Justice, Anti-War Committee – Chicago, Chicago Socialist Party, Chicago Veterans For Peace, Gay Liberation Network, Illinois Coalition Against Torture, International Socialist Organization, Jewish Voice for Peace-Chicago, La Voz de los de Abajo, Neighbors for Peace, NW Indiana Vets for Peace, SOA Watch, Third Coast Society, United States Palestinian Community Network, Vietnam Veterans Against the War, Voices for Creative Nonviolence, World Can’t Wait – Chicago (list in formation). Email us for more info or to endorse. March 19/20 is the anniversary of “Shock & Awe” on Iraq. Millions of lives were destroyed by this war and yet it has almost disappeared from the US landscape. Why? Is the war truly over? Our conversation begins at 9 PM Central. We’ll be joined by Larry Everest, author of “Oil, Power & Empire: Iraq and the U.S. Global Agenda.” As a writer for Revolution newspaper, Larry was in Iraq, reporting after the Persian Gulf War, and he has written extensively since then about U.S. aggression towards Iraq. We are collecting questions now, so that we can make the best use of our one hour conference call. Send your comments, questions, or a particular area you’d like to explore in the conversation to Debra Sweet. Join our Facebook event and invite friends to be part of this. And be sure to register here to join the conversation! Yemeni Detainees at Guantanamo – Why Are They Still There? 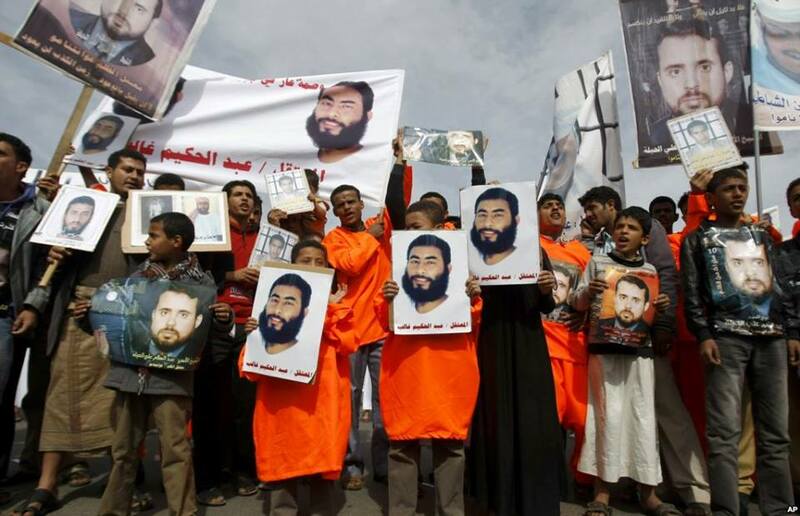 There are currently 56 Yemeni detainees at Guantanamo who have been cleared for release. That means the US government has investigated and found that they are not guilty of any wrongdoing. 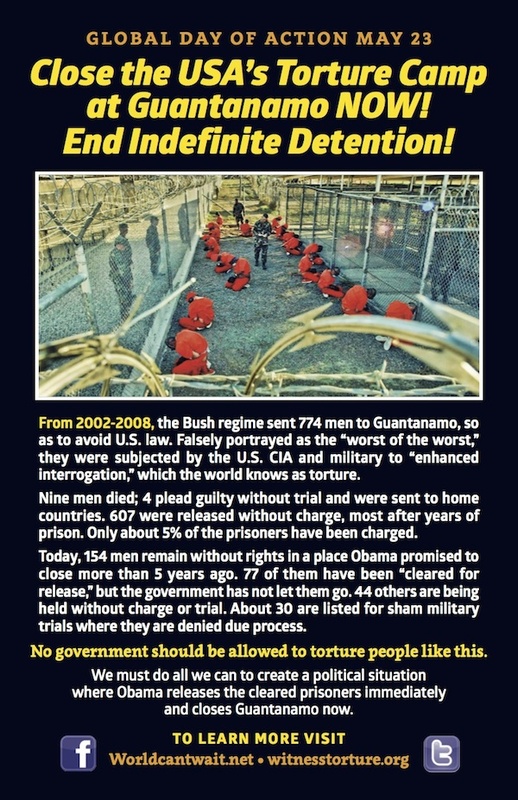 Many of them have been tortured; all have been held indefinitely for years now. Why is it that, despite the Obama administration’s admission that they have no reason to hold these men, no progress is being made in releasing them? The government of Yemen is willing to accept the men if they are released and has asked for US financial support in repatriating them. So what are the real forces at work, here and in Yemen? Join us for free film screenings and discussion with Len Goodman, a Chicago lawyer who has represented a Guantanamo detainee and written about the assassination of a US citizen in Yemen by a US cruise missile, Assassinating the Rule of Law. We’ll screen Laura Poitras’ award-winning film, “The Oath,” that tells the story of two brothers from Yemen, one of whom spent more than 6 years at Guantanamo. She uses footage shot in Yemen and Guantánamo to tell a complex story that “challenges notions of the US post-9/11 strategy.” (IndieWire). Laura Poitras is the filmmaker working with Glenn Greenwald and Jeremy Scahill on the new investigative project, The Intercept. If you are on Facebook, please “join” our event there and invite friends. This event is sponsored by the Chicago Coalition to Shut Down Guantánamo (World Can’t Wait Chicago, Witness Against Torture, White Rose Catholic Worker, Illinois Coalition Against Torture, Chicago Committee to Free the Cuban Five). It has been endorsed by the Chicago Chapter of Veterans for Peace (list in formation). Shining A Light on the Truth about Guantanamo and Drones: Don’t Miss These Events! Is it ever morally justified to risk one’s life for justice? Or to prevent someone from doing that? One year ago this month, courageous and desperate men imprisoned at Guantanamo began a hunger strike. Their action has again focused world attention on their plight and revealed the intransigence of the Obama administration on Guantanamo. On February 27, the Chicago Coalition to Shut Down Guantanamo* hosts an evening to examine how the detainees have put their bodies on the line to defeat their unjust imprisonment without charges or trial, and how forced feeding is used to block their last form of protest – denying themselves nourishment. We will screen the award-winning film, Doctors of the Dark Side, that explores the critical role of physicians and psychologists in crafting and implementing programs of detainee torture at Guantanamo. The film will be followed by a panel discussion of the serious legal and ethical questions posed by both hunger striking and forced feeding. The Guantanamo prisoners have said this is their last means of protest, and they would rather die than continue in conditions of extreme isolation and torture. Obama has defended forced feeding as a means to prevent death, even though it is widely regarded as torture. These issues are not confined to Guantanamo. During last summer’s hunger strike by prisoners in California to end solitary confinement, a court held that the State could force feed them. And right now, some prisoners at Menard Prison here in Illinois are engaged in a hunger strike to end their solitary confinement as well. As prisoners stand up for humane treatment, where will we stand? Our panel will feature Dr. Frank Summers, a clincal psychologist who has played a leading role in the fight within the American Psychological Association to bar members who participate in torture. We have also invited Abu Noor Abdil Malik, Muslim chaplain at DePaul University, to shed light on the Islamic perspective on risking one’s life through a hunger strike to attain justice. Please join us for this important film and indepth discussion of these and other questions. If you are on Facebook, please ‘join’ the event there and invite friends. This event is also endorsed by Radical Public Health. The Chicago Coalition to Shut Down Guantanamo includes World Can’t Wait Chicago, Illinois Coalition Against Torture, Witness Against Torture, White Rose Catholic Worker, Chicago Committee to Free the Cuban Five. World Can’t Wait has endorsed this international call for coordinated actions in April and May. Read and endorse the call at KnowDrones.org. Each new revelation of the NSA’s role in targeting drone assassinations, including the targeting of US citizens, makes this action more urgent. We will be developing plans locally and nationally. Please share your thoughts and ideas with us! Kevin Gostzola reported: ‘NATO 3′ Trial: Only Person to Talk About ‘Terrorizing’ Chicago Was an Undercover Cop and Judge Evokes Dystopian Scene of Terror, Declines to Acquit ‘NATO 3′ of Terrorism Charges. On Saturday February 1, about 20 people braved a snow storm to gather at a church in Evanston, Illinois, to hear Kevin Gosztola talk about the NATO 3 trial that he has been covering on Firedoglake.com. Sponsored by World Can’t Wait Chicago, 8th Day Center for Justice, Neighbors for Peace, and Occupy Evanston, the afternoon succeeded in raising funds and discussing some of issues posed by this important trial. The trial began on January 21, 2014, but the three young men on trial, Brent Betterly, Jared Chase, Brian Jacob Church, were arrested in a raid on an apartment in Chicago just days before the NATO meeting, and protests of that meeting, in Chicago in May 2012. They have been held on $1.5 million bond ever since. The three came to Chicago weeks prior to the NATO meeting from Florida, where they had been involved in the Occupy movement. They were targeted by 2 undercover Chicago police officers during those weeks and, a few days after the raid, they were charged with conspiracy to commit terrorism under an Illinois terrorism statute passed shortly after 9/11, and with other felonies. Kevin shared with the audience many important revelations that have come out as secretly recorded conversations have been played in court and prosecution witnesses – mainly the two undercover cops – have given testimony and been cross examined by the defense. We now know, for instance, there was widespread suspicion-less surveillance of activists in the months leading up to NATO, originally authorized by the Chicago Police Dept in February 2012. Kevin pointed out that in this case the undercover officers broke their own rules about what they could and couldn’t do in gathering intelligence. For instance, they were only supposed to report on any planned “criminal activity” they heard about, but the undercover cops’ own testimony has shown that they were collecting information on activists regardless of any “planned criminal activity.” The cops went to concerts, events, and protests, reporting names and information on activists, and in one situation they even ran license plates of cars parked at an event. However, as Kevin pointed out, it is troubling that the police in the weeks leading up to NATO and now the prosecutors conflate anarchism with “terrorism” and attempt to paint their operation as aimed only at “black block” activists, even though the undercover cops infiltrated Occupy Chicago and hung out at many venues that had nothing at all to do with anarchists, however that term is construed by the cops. And what can be just normal occurrences are suddenly painted as part of an alleged conspiracy. For instance, the mere fact that the defendants were driving around in downtown Chicago, apparently lost or perhaps looking for parking, was construed by the cops as “looking for targets.”These revelations point to the need for everyone to understand our legal rights and be aware of how police, FBI and other agents will try to trick people. World Can’t Wait distributed a sheet at our Saturday event with links to important “know your rights” information from the National Lawyers Guild, Center for Constitutional Rights and Revolution newspaper. Another revelation that should concern all of us is the fact that the undercover police themselves made strong suggestions to the three defendants that they make Molotov cocktails. In fact, it appears that one of the undercover cops was the first one to make that suggestion. This operation is looking more and more like a classic case of police entrapment, and it is possible there may have been evidence tampering as well. For example, during the raid, four beer bottles were collected that allegedly had gasoline in them, but then they were emptied into a toilet by the police evidence technician. NATO is the North Atlantic Treaty Organization made up of heads of states and military commanders who come together to make decisions related to war…the country that heads it is the US., standing at the top of a worldwide empire. NATO is the umbrella military alliance waging war on Afghanistan, and it was responsible for the bombing of Libya. Its conference in Chicago was the first held in a major city in the US in decades, aimed at showing that Obama and his former top aide, Rahm Emanuel, now Mayor of Chicago, could keep a lid on protests. Yet despite all the threats and repression, many thousands came out to protest NATO’s crimes against humanity carried out in the war of terror. While NATO generals and heads of state plotted their crimes behind barricades, we took to the streets and honored the vets of the Iraq and Afghanistan wars as they threw their medals away and spoke in solidarity with the peoples they had once seen as enemies. All that is why the police, or in a much larger context the ruling forces, break their own rules…they need to intimidate whole populations through repression in order to keep committing the crimes they are committing, lest growing numbers begin to dissent against those crimes, and yet they also boast that theirs is a “rule of law.” Isn’t this the gaping disparity that Edward Snowden saw in the massive NSA surveillance, which led him to reveal it to the world? When repression is the only answer that the ruling forces have to people’s righteous opposition to their crimes, it highlights their illegitimacy. We must both oppose those ongoing crimes and fight this repression by standing up for those who come under the weight of the state’s repression, by pointing out to the masses of people why people are resisting to begin with, and finding the ways to resist these crimes through mass visual political protest.